If you've published an app on Android Market, you’ve probably used Application Statistics to help tune your development and marketing efforts. Application Statistics is a set of dashboards in the Developer Console that shows your app’s installation performance across key dimensions such as countries, platform versions, device models, and others. Today we are making Application Statistics even more powerful for publishers, adding new metrics, new ways to analyze your data, and a redesigned UI that’s much easier to use. First, we are adding important new installation metrics to the dashboards. You can now see your installations measured by unique users, as well as by unique devices. For user installations, you can view active installs, total installs, and daily installs and uninstalls. For devices, you can see active installs as well as daily installs, uninstalls, and upgrades. Along with the new metrics, we’re also introducing two new data dimensions — Carrier and App Version. You can use them to track your app’s installation trends across mobile operators or monitor the launch metrics of specific app updates. To give you visibility over your installation data over time, we’re adding timeline charts for all metrics and dimensions. At a glance, these charts highlight your app’s installation peaks and longer-term trends, which you can correlate to promotions, app improvements, or other factors. You can even focus in on data inside a dimension by adding specific points (such as individual platform versions or languages) to the timeline. Finally, we’re bringing you all of the new metrics, dimensions, and timelines in a completely redesigned UI that is faster, more compact, and easier to use. Each dimension is now displayed in dedicated tab, making it easier to click through your stats daily or as often as needed. If you track your stats in another tool, we’re also adding an export capability that lets you download your stats in a single CSV file. 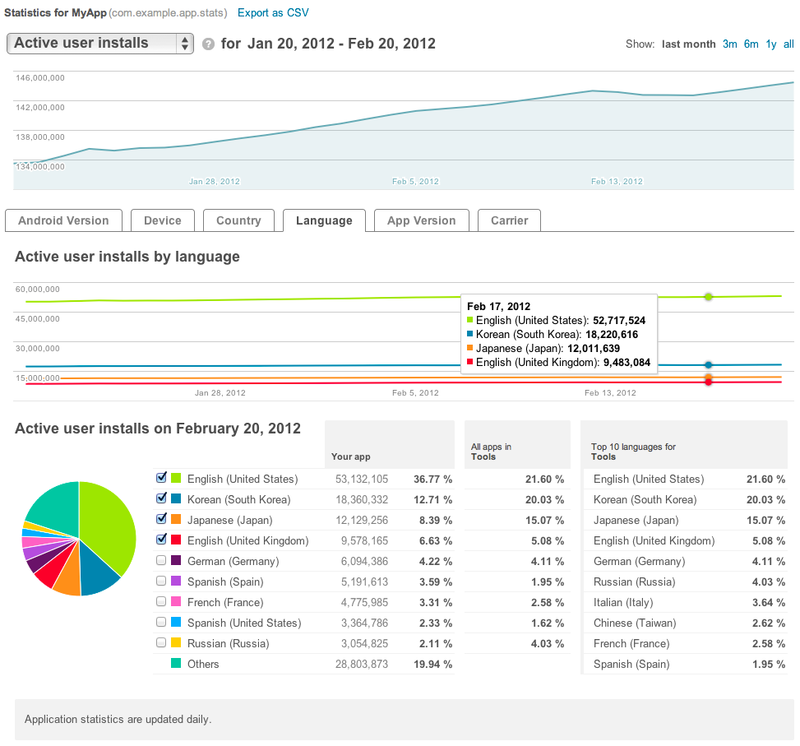 Check out the new Application Statistics next time you visit the Android Market Developer Console. We hope they’ll give you new insight into your app’s user base and installation performance. Watch for related announcements soon — we are continuing to work on bringing you the reporting features you need to manage your products successfully on Android Market. Please feel free to share any new insights or tips on +Android Developers!